On March 26th of the year 2013 our family welcomed Nathan Rocco Dukes into our lives. He was born without any complications and weighed in at a normal 7lbs 4 oz. 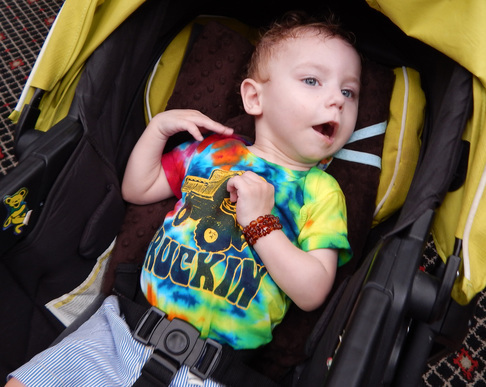 We noticed right away that Nathan had low muscle tone and nystagmus present at birth. As the weeks went on, we remained hopeful that Nathan would begin to show improvement. At his 3 month check-up, he couldn’t hold his head up, or roll over, or do any of the things children begin to do early on in life. It took us about 9 months before we could finally figure out why. The hardest part of the diagnosis process was being told visit after visit that my son was not thriving like normal children. “Nathan has not gained enough weight” were the words that I began to fear the most. In the beginning they would send us home with new formula recipes to try and different feeding regimens with hopes that it would help Nathan gain weight. When none of this worked, we felt like our backs were against the wall and eventually we were admitted into C.S. Mott Children’s Hospital at the University of Michigan. This is where the tube feeding began. If anyone has used an N-gtube they will know the extent of the madness that your life becomes with those things. It worked though, Nathan began to gain weight and keep it on. Next were the swallow studies, the motor evaluations, the blood tests, the brain scan and finally the genetic testing.It felt like U of M Hospital became our second home. We would study the doctors as they studied our son. We could tell they knew something was different about him but they couldn’t tell us exactly what it was. The results from the genetic testing showed a duplication on Nathan’s PLP1 gene. As it turns out Nathan has PMD, but he also has a smile that can light the darkest of places. Nate will be 3 years old soon and throughout this short time we have learned a tremendous amount about the disease and how to go about parenting our son in the future. Nate goes to occupational and physical therapy twice a week and has shown a great amount of improvement since birth. He can focus better, hold his head up on his own for a short time and, most importantly, he interacts with his environment. We learn new things about him every day. Nate loves to watch his Baby Einstein videos and enjoys being the center of attention. He loves getting out of the house and being pushed around in the stroller outside. He enjoys back rubs from his grandpa and being held by his grandma. As Nathan’s mom, it is important for me to spend valuable time with my son and provide as many life experiences for him as possible. Nate may never walk or talk, but he definitely understands. He understands that he is loved deeply by the people around him. He is the center part of a family bond and support system that would have never existed if it were not for him. Our family attends the annual PMD conference in Indianapolis, Indiana. This is where we learn the most about the disease and where Nathan can spend time with his PMD brothers. We are thankful for our son, our family support, and being a part of the PMD Family.